For a recent 80's costume party, I decided to do my very own take on a DIY Dread Pirate Roberts costume. Dressing up as this particular Man in Black isn't all that hard to do providing that you get the essential look just right. In this Dread Pirate Roberts costume DIY page, I walk you through exactly how I dressed like this cool character from The Princess Bride. You can see a finished photo of how I looked near the end of this cosplay guide. Dressing up as Westley in his black clothes doesn't need to cost much. In fact, I only bought just a few small items to rock this look. Luckily, like most people, black is a staple color in my closet so I already had clothes to use and managed to borrow some extras for the occasion. ⭐ No Time to Put Together a DIY Costume? See My Complete Guide With Links to ALL Costume Accessories to Buy for the Dread Pirate HERE! In this costume guide, I'll run you step by step through what I did to pull together my DIY Dread Pirate Roberts look. Since black is a color in most people's closets, you may already have most of what you need. If not, parts are easy to get hold of. Let's run you through my look. 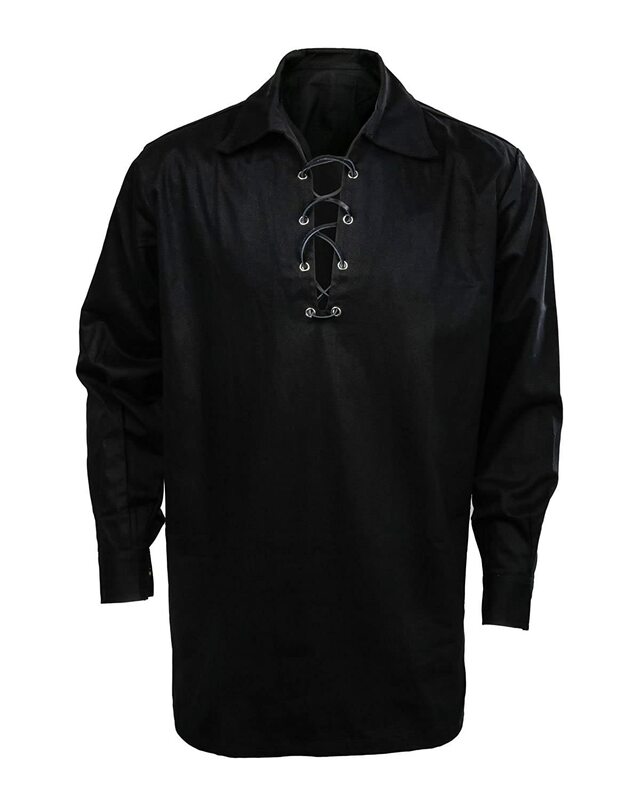 Westley wears a long sleeve black shirt which has a lace up front. 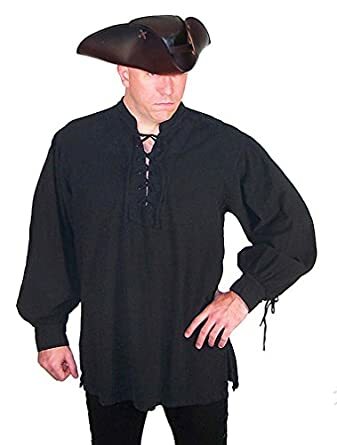 If you really want to copy the exact movie look, you should hunt for a black pirate costume shirt or, alternatively, a renaissance shirt. Hunting through my closet, I had neither. 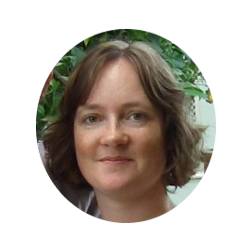 Luckily I found that my husband had a long sleeve black shirt which worked well enough. It was big enough to get that puffed out hero look once I slung a belt around the middle. This type of black shirt is fine for a male or female cosplayer or a do it yourself look. This is just like the one I wore for the party. Any black shirt will work for cosplay but you really need one with long sleeves since Westley is covered from head to toe in black garments. It will kind of spoil the look if you go for something with short sleeves. As you can see, you can get much closer to the actual design by opting for a pirate shirt with lace up front but really any black shirt will do the job. The buckles on my knee high boots had a rather pirate look and feel to them. Just right to duel in! As a female who loves shoes, I was lucky to already have a suitable pair of knee high black boots to wear. Mine were flat with buckles which really fits with the whole pirate theme. For female cosplayers, I reckon high heel boots would look kind of cool too. Men don't always have knee high boots on tap. Although the boots really help to turn you into what people expect for this character, you can get away with short black boots. ⭐ Alternatively, look for pirate boot covers or tops which are a less expensive way to get the look for his footwear. Females can wear long boots over black leggings or tight black pants or jeans which is what I'd recommend for men. With the main top and bottoms sorted, you've got most of the Westley look covered. Hopefully you can find most of what you need in your own stash or someone else's. 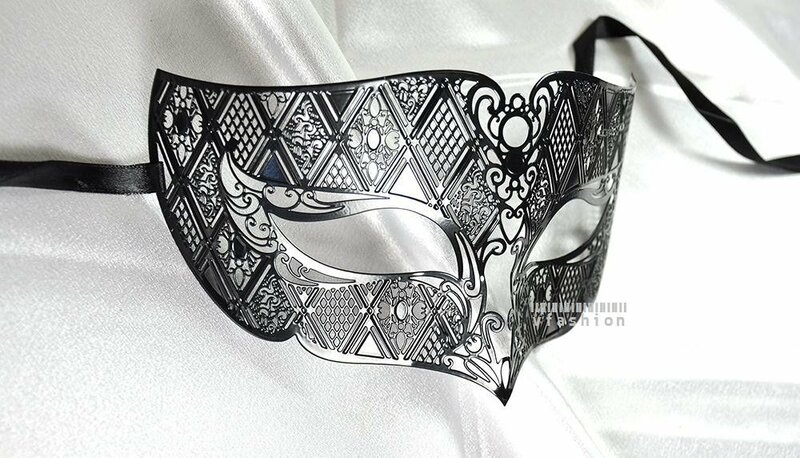 Although Westley wears a plain eye mask, I wanted something that looked good as well as being terribly comfortable to wear. 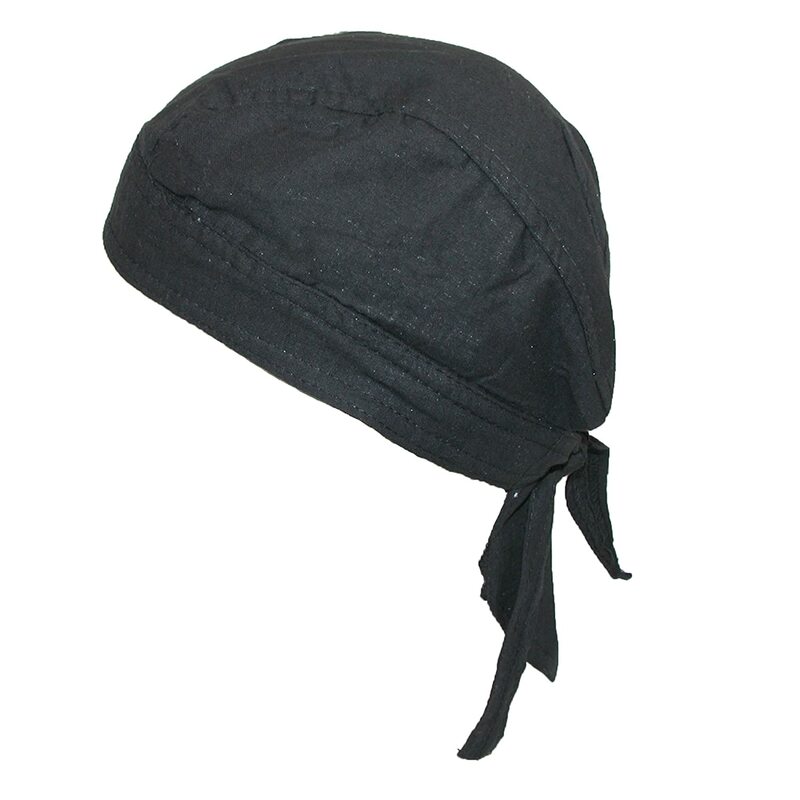 If you have a large piece of black fabric, you may be able to tie your own headwrap for your DIY Westley costume. If not, I'd look to buy a solid black bandana skull cap. Mine, one of the few items I actually bought, came pre-formed with ties at the back so I could slip it straight onto my head. It made it much easier to get one like this and it took the stress out of fiddling about and tying a bandana myself. Cary Elwes wears a plain black eye mask in The Princess Bride movie. You can buy a plain one for sure. However, the great thing about putting together a costume yourself is that you can break the rules. I chose a fancy looking eye mask to give a slightly different look. Whatever you do, you need the eye mask and head gear for this character. He's meant to be clothed in the same color from head to toe and it also gives him that edgy, cool and mysterious handsome hero vibe too. Miss this out at your peril. Westley wears a black waist sash made of wide black fabric and a ring belt over the top. The belt is a cool, added detail and necessary if you wish to also carry a costume sword accessory. I skipped on this part since it would have got in the way of dancing. In my closet, I found a long silk black neck scarf which worked well as the wide waist sash. My husband had a belt which I fitted over the top. Just a belt would be fine but you could leave out these extras if you want and you'd still be recognizable as this Princess Bride character. I already had some leather gloves which worked for this DIY outfit. Here's a closer pic of the lanyard I wore with The Princess Bride on. Westley's gloves are similar to leather gauntlet gloves which come over the tops of your long shirt sleeves. I already had some suitable gloves so I used what I had. The important factor is you can't really be a Man (or Woman) in Black unless you cover most of your skin just like our hero Westley does. 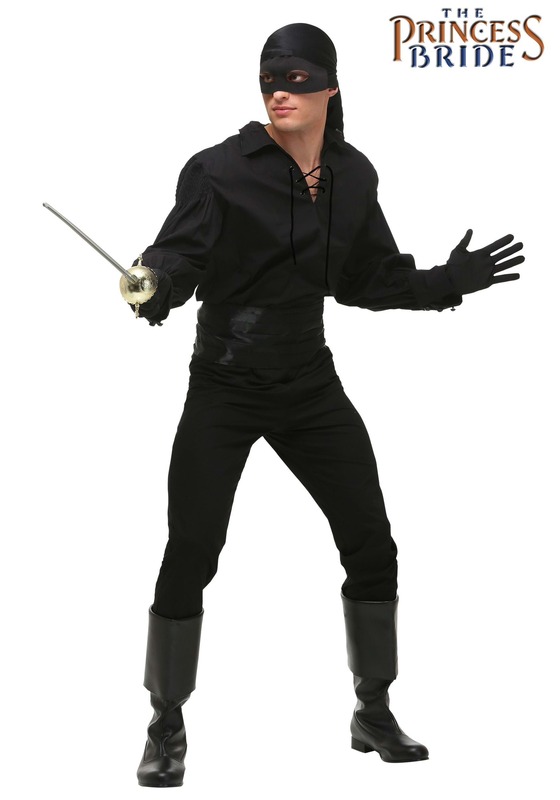 HalloweenCostumes.com have their own officially licensed costume set for Westley in his Dread Pirate guise. The set includes pretty much most of what you need to dress up as this character. 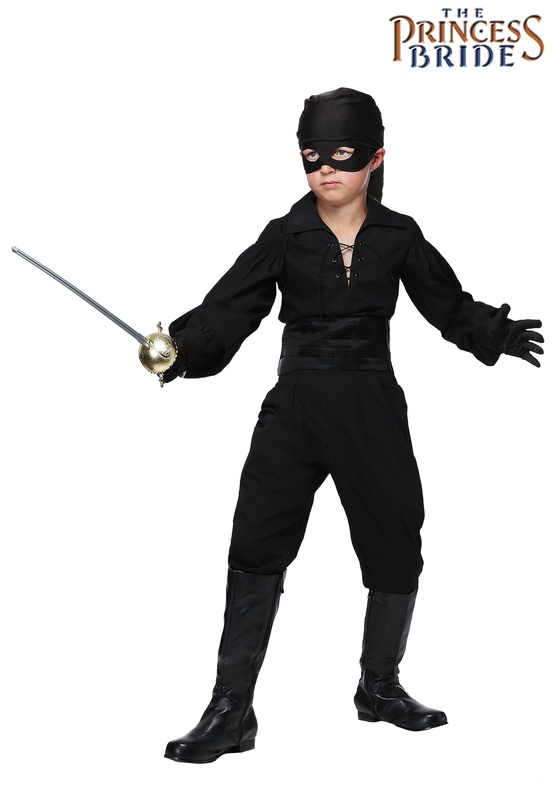 This costume set has the following items included: a black shirt with lacing design at the front, black color pants with elastic waist, a waist sash, head scarf, eye mask and a pair of black gloves. The sword and boots in the photo are not included in this set. However, you can add on your own quite easily. You could additionally add on a medieval ring belt and a frog belt hanger so that you can carry a sword around. You can see I really was all in black, even my bag. Someone drew a mustache on with an eyebrow pencil and I wore a Princess Bride lanyard that I made myself around my neck. A fun time was had that evening! It is very easy for both males and females to dress up as Westley using this particular fancy dress idea. Hopefully you will be able to find most of what you need right at home. Since I already had or borrowed most of the clothes for this outfit, my spending was really minimal. I only paid for a bandana skull cap and my eye mask. At least I know I can recycle those and dress up as Zorro for something else.